Approach the living room and immediately note the cat’s suspicious behavior. Kitty is facing the entertainment center with the attentiveness of a hunter with cornered prey. Listen for the tell-tale scurrying of a mouse or rat. Yep. No mistaking that sound. Call for back up. In this case I asked my son to close the cat in a room and keep him there till further notice. Search under and around the 400 pound entertainment center, flashlight in hand, nerves on edge. With my son’s help, roll up the carpet and maneuver the heavy furniture away from the wall. Note the beautiful markings on the healthy, brown rat dancing a jig on the wires. Shudder. Estimate the size of the rat, just for fun. (Six inches of rat, plus another six inches of rat-tail.) Let’s call it an even dozen. Realize you will not sleep tonight knowing an enormous rat is running loose in your house. 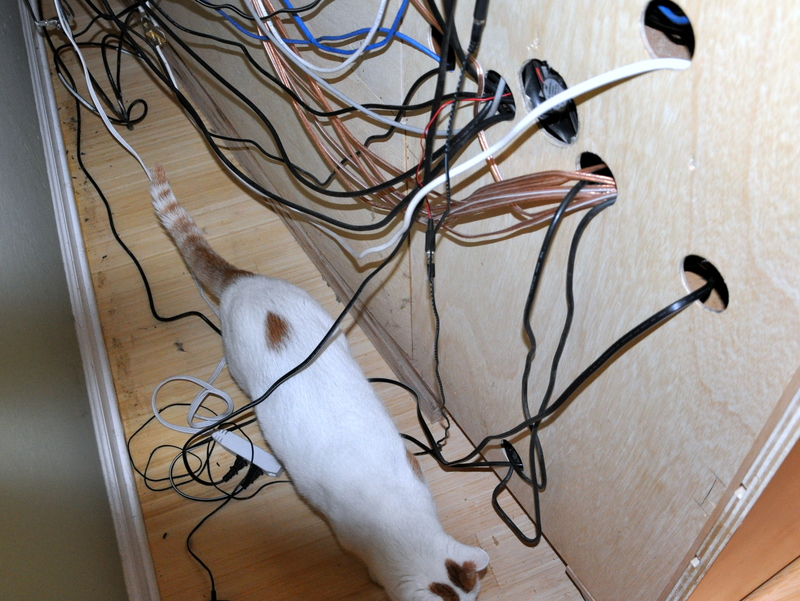 Watch the rat drop down from the wires, and attempt to hide under the entertainment center. Thinking you have him cornered, look up, then down, only to have him disappear like a rabbit in a magician’s hat: here one second, gone the next. Plop down on the sofa, chin in hand, nerves frayed and ponder your next move. Aside: at this point my husband walks through the front door, takes one look at me and asks ‘what’s wrong?’ A mere nod of my head toward the rolled up carpet and displaced furniture is all he needs in the way of an answer. Yes, we’ve been through this before. Re-locate the rat. Employ two adults, one teenager, a pair of flashlights and your wits. Aha! The rat has managed to circle the entertainment center, crawl up the back, through one of the holes for the wires and back to his nest. Apparently he’s been here awhile. Could this be our kitchen rat at long last? 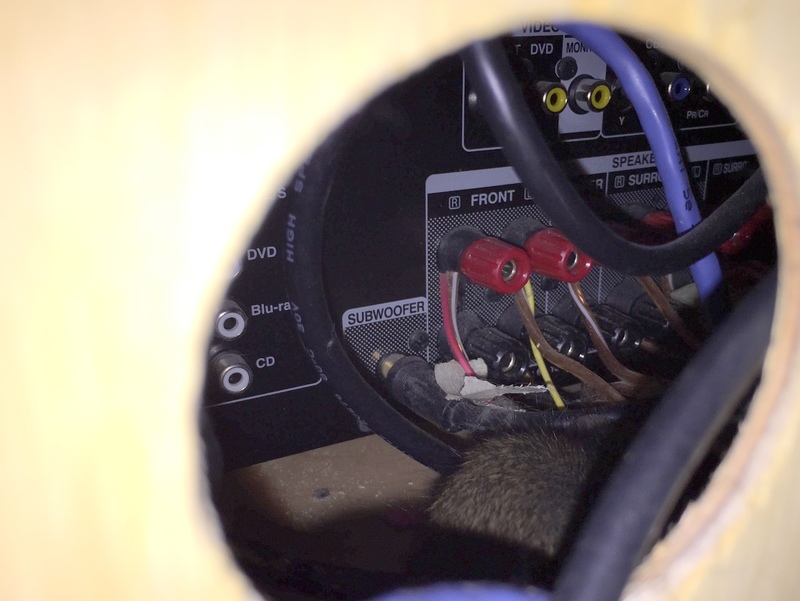 Photograph the rat through the hole in the entertainment center (Hey I write a blog you know). Tape three of the four potential exits closed with cellophane tape and cardboard. Cover the fourth opening with long, narrow plastic bags originally used to cover the newspaper. Add a cracker for good measure. Stand guard at the back of the opening hoping the rat will exit through the hole, into the bag so I can spirit him out the back door. Meanwhile my husband Mike gingerly removes the stereo receiver. The rat has two options: One, exit into the bag, or two, fly out the front of the cabinet. He goes with option two. Mike grabs the rat between two gloved hands, the rat squeals, and a startled Mike drops the rat to the floor. He makes a run for it. (The rat, not my husband). The three of us watch as the rat makes a break for it. He avoids the open door (of course) and runs under the book shelf instead. Thinking that clearly we have him cornered (and we do), we also realize there is a ‘secret compartment’ left by the builder between the wall and the cabinet. The little compartment is cozy, rat-sized and available. Aside: We’re all exhausted at this point and decide to regroup. Watch gratefully as Mike wraps tape around the lower half of the bookshelf and sets the live trap. There is only one way out and that is into the trap. Now we wait. 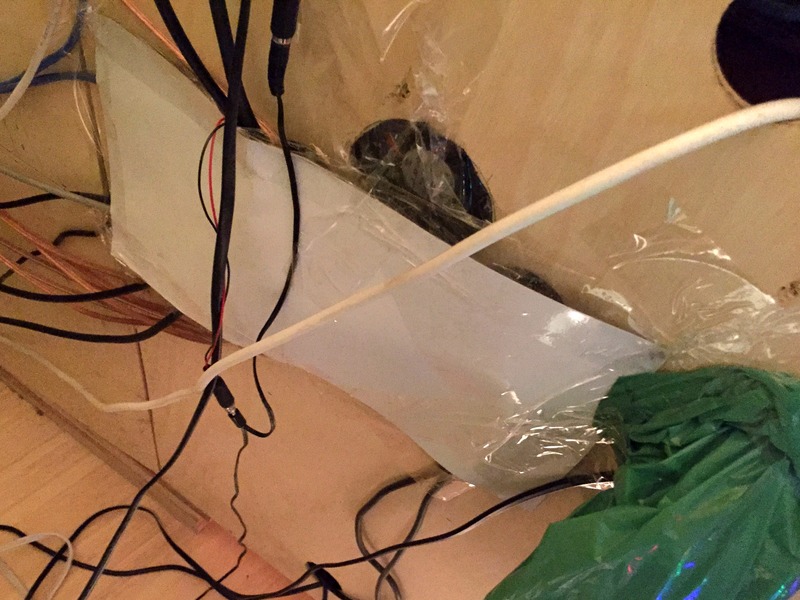 This entry was posted in Rats and tagged cats and rats, humane traps, Rats, rats in the house. Bookmark the permalink. LOL…”12 inches of the little pooping, chewing menace.” You made me laugh (again). Yep, that’s what he is alright. A highly intelligent, illusive, pooping machine. 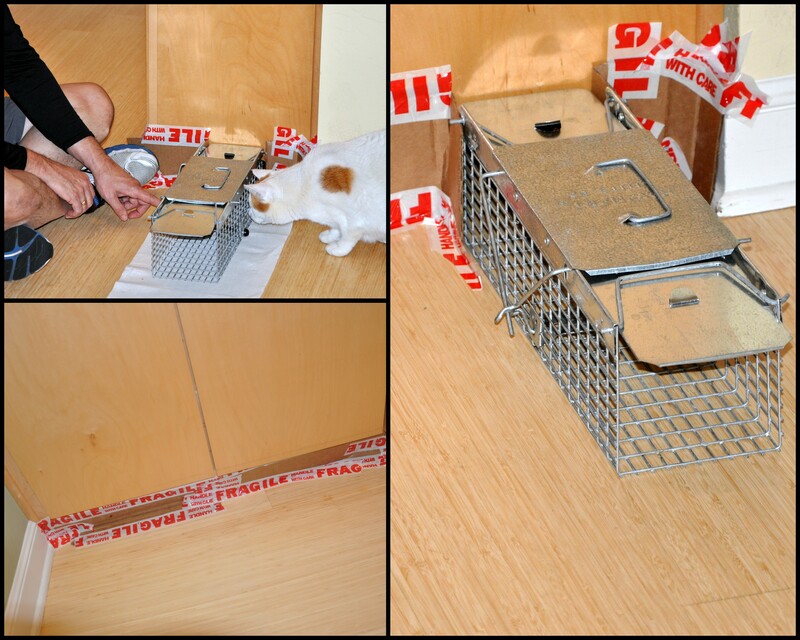 We set the extra-small rat trap for several nights to no avail. Mike went on-line and bought a largish mouse trap. The trap tripped one night, the peanut butter is once again gone, and the elusive rat nowhere to be seen. How does he do it??? Loved Ratatouille. Such a clever rat. The actor that voiced Remi the young chef is now on a show called Forever as a quirky medical examiner. Love him. His voice is so distinct. I can’t imagine how la rat is evading le trap. Maybe you should call him Harry as in Houdini? Do your kitties wear flee collars? That’s what I’d worry about too. I haven’t watched Forever. I don’t think I’ve even seen an add for it but you’re right. He does have a distinctive voice. I read a link about trapping rats and they suggested putting the peanut butter on a cotton ball. They might hang around longer to like it off and then trip the trap….eeek, will he ever be mad! What an interesting idea about the cotton ball. We’ll have to give that a try. Let me find the link for Forever. Oh no! Now ants. Hon, I’m sorry to hear that. They give me the eby-gebies. We looked at a brand new house where the front porch was crawling with them. The contractor said, just about every house they build, when they dig up the yard they disturb ants. They’re *everywhere*. Last year they were even in the Imaging Office (where you get Mammograms). The concrete sidewalk had a big crack and they were coming thru it. The whole parking lot was pavement, the Blvd with trees was a long way away. Just concrete and pavement and one giant crack and those pesky ants found their way…Grrrrr is right. Oh you poor things Alys! I do hope you catch him soon! Thanks, Cathy. Still no luck. I’m feeling quite defeated. I know this sounds silly, but if it were a tiny mouse I feel like I would cope better. Instead, it’s a substantially sized rat. I love that idea, Pauline. I suspect we could talk for hours on end, and not just about rats. I feel warm inside just contemplating the idea. Funny you should mention the eviction. I thought the same thing. It’s dropped considerably this week and the wind is howling too. No worries. That rat continues to allude capture. I sure hope you catch it. We lost several in the heat ducts. They couldn’t find the way back out. Not a pleasant result. You tickle me in your attempts to rescue this poor lost creature. I saw the post earlier but waiting till I could enjoy it before reading. I’m exhausted now. Felt like I was doing the moving and running around. I hope you catch it soon. We tried everything including peanut butter to catch ours. Happy New Year. I’m so glad it’s here! Thank you, Marlene. That rat remains as elusive as ever. We have a heating vent under the elevated bookshelf, so Mr. Rat is staying warm and cozy on this very cold day. The slats are too small for him to crawl in, however, but I can just imagine if he did. Did you have to replace all your duct work? You have my profound sympathies. As for peanut butter, its what all the ‘experts’ recommend. Last night the little stinker ate the peanut butter, left the cracker and DID NOT trip the trap. The night before he tripped the trap but didn’t get caught. It’s hair pulling. Meanwhile, three cats roam the house. Crazy!!! Omg that was entertaining in a looky loo kind of way! I would have been so freaked out! I love your illustrated how to (or not) approach to it all. 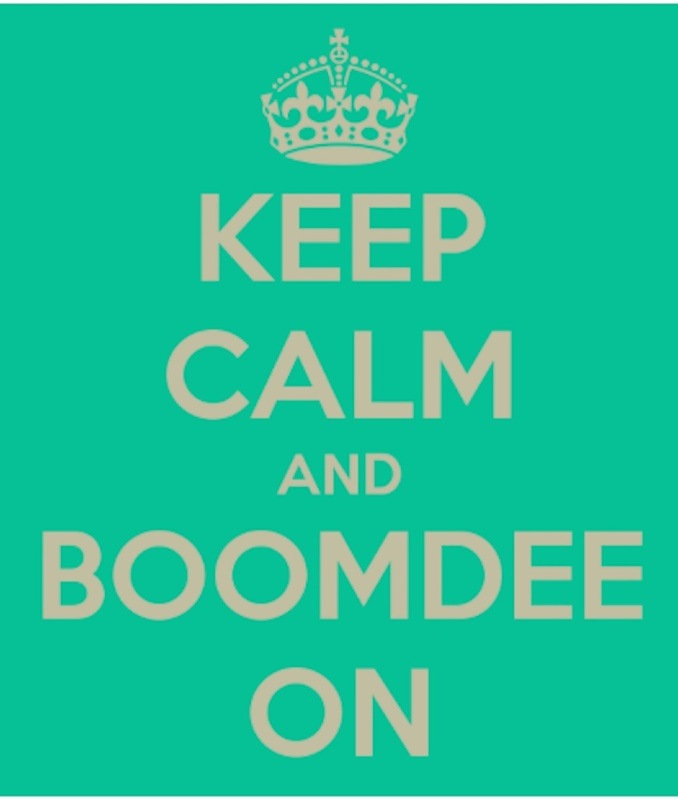 I would think this would be a caffeine or alcohol event…. Or perhaps both! Yes…I sure needed something after all this, including some sleep. Believe it or not, that elusive rat is still on the loose. I almost wish I hadn’t seen how big he was. Onward!